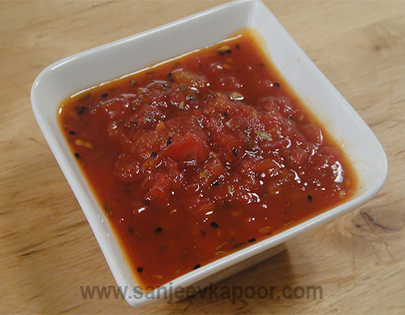 A popular chutney from Bengal – tomatoes cooked with paanch phoran and sugar. Mix together all the ingredients of paanch phoran. Heat oil in a non-stick pan. Add paanch phoran and sauté for 2 minutes. Add tomatoes and sauté for 2 minutes. Add salt, cover and cook for 5-7 minutes. Add green chillies and red chilli powder, mix well and cook for 2 minutes. Add sugar, mix well and cook for 5-7 minutes.